There’s no doubt that Athens is an extremely appealing city to photograph. This is why, all year round, you’ll see tourists balancing precariously on the shiny marble walkways at various archeological sites in the city, waving a selfie stick. 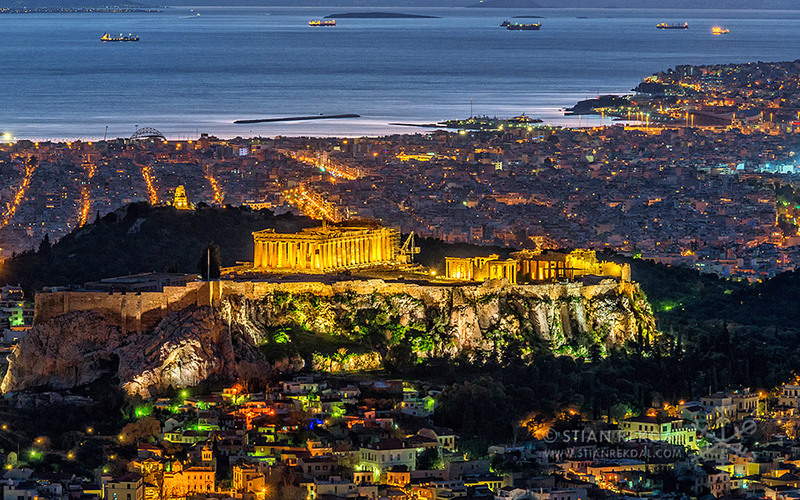 The city’s beauty was not lost on Norwegian photographer Stian Rekdal, whose timelapse video of some of the best sites in Athens, titled simply “Athens” has been viewed over 55,000 times on Vimeo. He spoke to Greece Is about his work, which has been featured by the National Geographic, BBC, NBC, Sony, Rolls Royce, Icelandair and more. Stian’s love for Greece is long-term affair which began 10 years ago on a short trip to Santorini. He jokes that he was meant to come for two days and ended up staying for 10 years. As of 2014, the 37-year-old photographer has been living in Greece permanently with his girlfriend, who he also met in Santorini 13 years ago. They decided to move to Greece for the better weather and superior photography locations, plus the fact that his income from photography goes further in Greece than it did in Norway. Photography for him began as a hobby around five years ago. His experimentations with new photography formats were noticed by major electronics manufacturers who used them to demonstrate their ultra-HD screens at retail outlets and trade shows worldwide. This was the breakthrough that led to his hobby bringing in money to the point that he was able to pursue photography full time. The video he made is not actually a video, he explains. “Timelapse is basically video with the benefits of photography. It also gives you full control of the picture. You don’t get that with a regular video camera.” says Stian. “With timelapse you can do all the tricks that photographers do, you just have to do it 200-300 times with 200-300 pictures.” he says. The result is an ethereal combination of images in vivid colors that mix together beautiful shots of famous sites in Athens as clouds race overhead through blue skies and the tiny figures of people zip around. In between, several drone shots give perspectives from above. The video takes the viewer through scenes of the Panathenaic Stadium, panoramas of urban Athens, Zappeion, the Acropolis, the Caryatid Porch of the Erechtheion, the Odeon of Herodes Atticus, the Acropolis museum, Athenian street art, Monastiraki square, the Temple of Sounion, OAKA Olympic Stadium, Syntagma Square and Plaka, with the images shifting across the day into the night. In total, the final video took more than 1,000 hours to produce, but the results speak for themselves. Set to a piece of relaxing music, it’s a tribute to Athens that makes even residents want to go out and rediscover the places featured. Finally, as for what he likes about life in Greece, for the photographer, the answer is simple. “Where to start? The climate, the food, the people, the language, the Greek attitude to life.” he concludes.